To provide unprecedented educational opportunities for the region, Georgia Southern University and Savannah State University (SSU) will host a joint open house on Georgia Southern’s Liberty Campus in Hinesville on Feb. 7 from 5:30 to 7:30 p.m.
Military members and their families, and other prospective students, will have the chance to learn more about career-enhancing programs where they live and work. During the event, SSU President Cheryl Davenport Dozier, and Georgia Southern Provost and Vice President for Academic Affairs Carl L. Reiber will discuss the universities’ strategic partnership and share more about the importance of making these programs available to prospective students. This innovative partnership enables students to enroll at Georgia Southern’s Liberty Campus as SSU students and complete the bachelor’s degree in Homeland Security and Emergency Management (HSEM) degree or certificate in Virtual Forensic Science: Evidence Processing, Documentation and Analysis entirely in Hinesville. Georgia Southern University’s Liberty Campus, with its state-of-the-art instructional spaces and collaborative environment, continues to prepare students for the workforce by offering affordable academic programs that include psychology, elementary education, nursing and a certificate in cybersecurity. 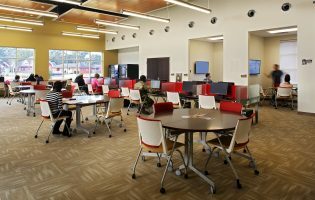 This unique campus experience in Hinesville focuses on student success, providing face-to-face instruction and evening class options. The addition of the SSU HSEM program and Virtual Forensic Science certificate provides students who call the Hinesville and surrounding communities home with the flexibility of choosing from extended degree programs offered by regional universities in their community. The HSEM program will be the first program to be offered through this partnership in Summer 2019. SSU is the first institution in the state of Georgia to offer a bachelor’s degree in HSEM. The program prepares students to assume leadership roles in emergency management, homeland security and/or public policy; participate in employer-directed training for specific roles and career advancement; and pursue graduate study in government, business, public policy, international affairs, law enforcement, policy planning or law. In Fall 2019, SSU is also adding an 18 credit-hour certificate in Virtual Forensic Science: Evidence Processing, Documentation and Analysis on both Georgia Southern’s Liberty Campus and the SSU main campus. Building upon the forensic science degree, this certificate will be open to students in any major as well as those employed in law enforcement, military or an associated area of forensic science, criminal justice or homeland security. The certificate program will provide an immersive learning experience with SSU’s exclusive 3D virtual reality crime scene investigation technology. Certificate coursework will cover procedures necessary for the proper use of 3D technology in criminal investigations, such as 3D scanning, processing, analyzing and the use of 3D virtual reality technology in courtroom presentation of crime scene evidence. Both universities have been recognized for their dedication to serving veterans, service members and their families with the Military Friendly® designation by G.I. Jobs magazine. Georgia Southern currently holds the number one place on Military Times 2019 Best for Vets: Four-Year Colleges. For more information, visit https://savannahdegrees.com/. Established in 1890, Savannah State University is the oldest public historically black college or university in Georgia and the oldest institution of higher learning in the city of Savannah. The university’s 4,100 students select majors from 30 undergraduate and six graduate programs in four colleges — Liberal Arts and Social Sciences, Sciences and Technology, Business Administration and Education.